For a while, I’ve considered what could solve the question of when the bite occurred. Something that would start the domino effect of facts that would naturally follow from it’s reveal. I’ve settled on one detail that I hope will solve the Fredbear bite once and for all. That detail involves one of the least-represented character in the entire series’ and proves when the bite occurred in a near-airtight way. 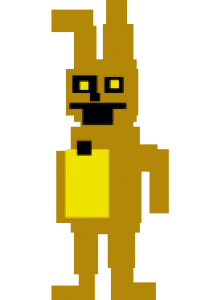 Spring Bonnie is actually the key to the Fredbear bite, for the reasoning of the suit being locked away. There is a definitive choice that has to be made about when the suits were locked away, and that choice cements the year of the bite. We must take everything into consideration concerning the older generations of restaurants. So to start, the most important thing to understand is that there were over six Springlock suits. There were four at the Fredbear location, and at least two at the Freddy Fazbear Pizza location. You get this from the minigames and the existence of the tapes. In the FNaF4 minigames, we can clearly see four suits in operation at the Fredbear location. You see the two on stage, in their animatronic mode. However, you also see that the employees – one of them assisted by the Purple Guy – are wearing Fredbear and Bonnie suits as well. This accounts for four total suits so far. The other two come into play in the FNaF3 phone calls. The location that the calls are directed to has only 2 suits, and it’s clear that a Springlock malfunction occurred at the sister location. So we must assume by this standard that the phone calls are from Fredbear’s diner, as Phone Guy’s mantra in the calls state you are the face of Freddy Fazbear’s Pizzeria. Now, we need to establish these locations properly first. The phone calls in FNaF3 were found WITH Springtrap. This is vital in determining the location that these suits were in operation. Naturally, Springtrap was found at the FNaF1 location. That leaves only two reasons why the tapes were there. Either they were sealed into the room with Spring Bonnie, or they were left inside that room after it was broken into. All things considered, it is more likely that they were left with Springtrap rater than dropped by Purple Guy when the location re-opened. Particularly as the tapes themselves could be seen as incriminating if found by investigators. This is perhaps what could unravel the argument, but I think most of the community will get behind the idea that the suit and the tapes were locked away at the same time. I don’t feel that is a long stretch. Now, back to why this is important. It is important to note that the FNaF1 and FNaF2 locations did not run parallel to each other. In the phone calls in FNaF2, Phone Guy mentions the “old location”. It’s clear that the old location has closed down due to its bad reputation, left to rot for quite a while. The animatronics were even removed, moved to this new location. But likewise, the old suits were kept after FNaF2, anticipating a return of the franchise. This leaves a clear choice for all to make. when were the tapes locked away in the FNaF1 location? Think about it. It cannot be anywhere near the FNaF2 time of 1987. You don’t just open new locations overnight or even over months, let alone return to old locations. As established in prior observations, the FNaF2 location is RE-opening. This implies it was open in the past, and was restarted after some length of time. This would surely cancel out 1987 in the past too, as the location of operation was still FNaF2’s location. 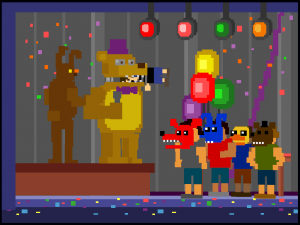 I’ve already established that the FNaF2 location was opened twice. Common sense dictates that it is highly unlikely that a location was closed, a new one opened, then closed, then reopened again in the space of 10 months. That’s not how business works, particularly considering that the animatronics took a full redesign, and the newspaper refers to the first iteration of the FNaF2 location as “vintage”. You don’t do that with locations that closed in the same year. I think it is fairly clear that the old location was not in operation in 1987 at any point. This also means that the Springlock failures happened in the Fredbear location. As it is the sister location to the old FFP location, this means that Fredbear’s had the incident that made the Springlock suits unwearable. Phone Guy states in his messages that the sister location to FFP experienced these failures, not the location he’s calling. Many of you will be going “oh duh, it was the bite kid who was involved in that incident”. To those people, I have to fail you on your base knowledge of Springlock suits. You are wrong. Let’s get into the science of the Springlock suits. They basically have toggled states. Suit, to animatronic. However, when they fail, the Springlocks are designed to snap it to animatronic mode. A Springlock failure designates a failure in which an animatronic in suit mode malfunctions, and snaps into animatronic mode, usually with a person inside. But Fredbear at the time of the FNaF4 minigames was not in suit mode. He was in animatronic mode. What was seen was not a springlock failure. it was a failure of the animatronic itself. This in turn leads to something fascinating. The Fredbear location did NOT shut down after the FNaF 4 bite. It shut down when someone wearing the suit was Springtrapped. Here is what is fascinating, though. In the books, it’s clear that Purple Guy suffered massive full-body scarring due to a Springlock failure. No death is ever implied for this failure. There is a chance that this failure happened to Purple Guy, who having lived, discontinued the suits from being worn. But this is conjecture. The point is, the location actually stayed open past the child’s death, until a Springlock failure occurred. This means that the suits were officially unused at either 1986 or before, or 1988 onwards. Depending on when the Springlock suits are removed, depends on the theory. If they were removed before 1986, then the bite has to have been in 1983. If the Springlock suits were used beyond 1987, then the bite could very well be the bite of ’87. While ’83 is still an outside possibility in that event, ’87 is the more likely candidate in that theory. While the latter arrangement would be more shaky than the absolute nature of the first option, the result of this question would topple a lot of jenga blocks of the lore, which could in turn lead to other questions being answered. It could lead to further questions that’ll help to cut down further lore paths, something that would be very much welcomed for theorists everywhere.